On the way out of Ghost Ranch, we explored the Agape Center, a bright, meditative room. 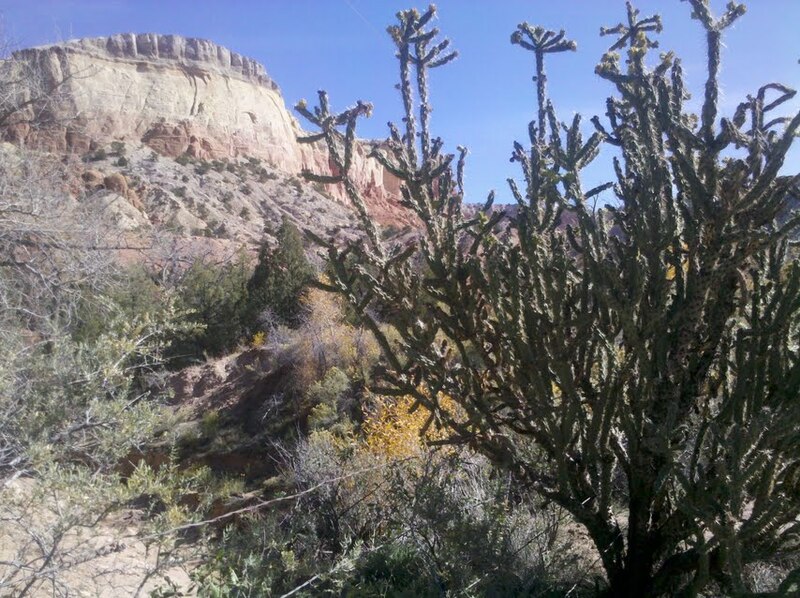 My sister-in-law, E., drove us out of Ghost Ranch towards Abibuque on the Old Taos Highway. We talked about my father-in-law, our husbands’ father, Taid, who had died about five years ago. E. said she was glad that Taid, a Welsh name for father, had visited New Mexico from New York years back. She had always been glad to see him, she said. At that moment, E.’s phone buzzed with an incoming text. “See who it is, please,” she said, handing me her phone. I flipped open her phone and no one was there — only the image of Taid, my father-in-law. Turns out my nephew had seen a big oil portrait of his grandfather and texted the picture of Taid, whom we were just talking about, to his mother’s phone. We felt it was synchronicity — a sign of the importance of family and father, maybe of travel, most definitely, a sign of happy memories and not tears, dried before the sunset.